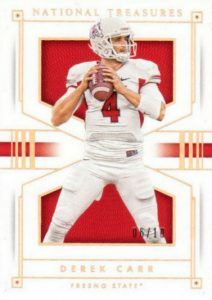 Bringing the NT brand and quality to a campus near you, 2016 Panini National Treasures Collegiate Football follows the 2015 multi-sport set with a direct gridiron focus. Boxes include a combination of autographs and memorabilia cards that offer six total hits. Taking the lead from the Flawless brand, 2016 Panini National Treasures Collegiate Football showcases a jewel base set. Adding to that are parallels, numbered to 20 or less, like Ruby, Sapphire, Emerald and Flawless Diamond (1/1). Heavy on hard-signed content for the incoming rookie class, 2016 Panini National Treasures Collegiate Football includes Material Signatures with an autograph and prime relic piece. Brand Logo parallels are limited to two copies. Combo Player Signature Booklets opts for a horizontal book card with dual relics along with an autograph. Parallels include Laundry Tag Brand (1/1), Team Logo Brand (1/1), Team Logo (1/1) and Team Slogan (1/1). Adding more autograph choices for the '16 draftees are Colossal Signatures and Signature Die-Cuts inserts. Notable Nicknames (#/25) showcases only the very best of college football with an added inscription. Team Logos displays the school affiliation and an on-card signature for top players. The other main component of 2016 Panini National Treasures Collegiate Football, memorabilia cards come in various designs. Rookie Silhouettes works with the well-known insert and offers Prime parallels (#/25 or less). Materials promises game-worn NCAA uniforms for the the biggest names across several decades, including Aaron Rodgers, Amari Cooper, John Elway and Troy Aikman. Brand Logos displays premium relic options while Team Quads goes with a quartet of players from the same school. Prime parallels for the Team Quads are limited to ten copies or less. PARALLEL CARDS: Century Silver #/25, Century Gold #/10, Century Black #/5, Century Blue 1/1, Printing Plates 1/1. 32 cards. *Cards found only in parallels noted below. PARALLEL CARDS: Prime #/25 (*Card #141 - #/18). 79 cards. Serial Numbered #/25 (*Card #268 - 1/1). PARALLEL CARDS: Silver #/10 (*Cards #198 - #/9; 268 - 1/1), Gold #/5, Black 1/1, Blue 1/1, Printing Plates 1/1. PARALLEL CARDS: Prime #/25, Brand Logos #/2. PARALLEL CARDS: Silver #/25, Gold #/10, Black #/5 (*No card #234), Brand Logo Red #/2, Blue 1/1, Printing Plates 1/1. 34 cards. Serial Numbered #/25. PARALLEL CARDS: Prime #/25 (*Card #27 - 1/1), Prime Brand Logo 1/1, Prime Laundry Tag Brand Logo 1/1, Prime Team Logo 1/1 (*Cards #23, 31 - #/5). PARALLEL CARDS: Prime #/35 or less, Prime Brand Logo #/5 or less, Prime Laundry Tag Logo #/5 or less, Laundry Tag Team Logo #/5 or less, Team Logo #/5 or less. PARALLEL CARDS: Prime #/10 or less (*No card #29). 59 cards. *Cards found only in parallels noted below. PARALLEL CARDS: Silver #/25 or less, Gold #/10 or less, Black #/5 or 1/1, Blue 1/1, Laundry Tags Team Logo Red 1/1, Team Logo Blue 1/1, Printing Plates 1/1. 12 cards. Serial Numbered 1/1 (*Card #13 - #/10). PARALLEL CARDS: Prime #/25 (*Card #2 - #/10). 57 cards. *Cards found only in parallels noted below. PARALLEL CARDS: Gold #10 or less, Black #/5 or 1/1, Blue 1/1, Printing Plates 1/1. 13 cards. Serial Numbered 1/1. PARALLEL CARDS: Prime #/10 (*Card #1 - #/5). PARALLEL CARDS: Prime #/10 (*No card #10).